The idea is that this is the heat press for the occasional crafter who wants to apply HTV to projects. ?Targetted at less frequent users and people who have no space to house a regular heat press, the Cricut Easy Press could well take off as a popular product. The main concern with the Cricut Easy Press has been that it is well known that pressure is required to bond HTV (Heat Transfer Vinyl) to your item. ?People who use irons use tremendous pressure to apply HTV in the absence of a heat press. ?Cricut has shown videos for applying vinyl, complete with shirts that have done multiple wash cycles to test the longevity of the HTV. ?So far so good according to Cricut. ?The crafting and pressing community remain skeptical! ?The Cricut Easy Press has a unique heat plate that provides a uniform temperature across the 9″x9″ press. ?See the image below that compares the Easy Press to a regular iron for temperature distribution. Let us know in the Comments and on Facebook – Like our page and jump into the discussion! Here is a great video walkthrough on how to use and configure your Shareprofit heat press. ?This is a great alternative to the very poorly written on non-existent manuals that come with these cheaper presses. ?The Shareprofit press featured is the same basic press used by BestEquip, OrangeA, Zeny and Vevor. ?The PDF version of the manuals can be found here for reference but check out this great video for a complete guide on how to use the press. This 5 in 1 heat press machine with 2in1 digital controller is out now. This swing-away heat press boasts all of the must-have attachments. This includes flat platen, mugs and plates. It can transfer colorful pictures and characters of sublimating and dissolved printing ink onto ceramics, glasses and textiles such as cotton, flax, chemical fiber, nylon, etc. Swing all the way around. Black Teflon coated heat surface. BestEquip 15″ x 15″ Multi function Heat Presses limited stock available! The BestEquip heat presses are fantastic value starter presses which offer interchangeable options for making T-shirts, hats, plates and mugs. Unlike most multi function heat presses the BestEquip presses offer a 15″ x 15″ full size heat plate – most multi presses max out at 15″ x 12″ which leave you short when pressing larger items. Order now and save anywhere between 17-24% off list, order fast as stocks are limited! Siser Easyweed is the standard when it comes to using Heat Transfer Vinyl (HTV). 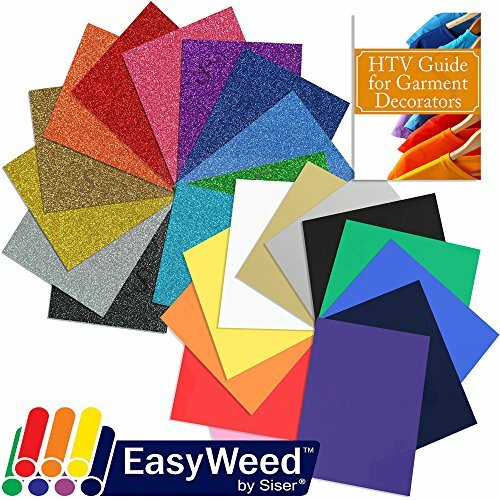 Siser Easyweed has special guidelines for applying the various types of vinyl – save this guide for future reference for when you are pressing your T-shirts and other custom designs. The guide offers information on how to cut the HTV as well as instructions on the types of materials that are suited for adhering the different types of vinyl. Care instructions are included reminding you that you should not wash any garment for 24 hours and that you should use a mild detergent and hang dry or dry on a normal setting. Most people also advise that you wash and tumble dry shirts inside-out. Siser North America has an app for iPhone, iPad and Android that covers Siser colors, application notes, care instructions and more! Heat Press 101 – How do I choose a heat press? There are many presses to choose from, not only in different price brackets but different form factors. ?Within the different types of heat press there are extra features to be aware of that may swing your decision to choose one press over another. ?Heat presses can be used for both heat transfer vinyl or for sublimation. Here we breakdown the types of presses and features available to you to guide you to the best press possible for your needs. The most common and basic heat press option. ?The press is simply a hinged hotplate that can press flat items like T-Shirts, shorts, pillows, onesies, bags and most other apparel. ?This it the most common type of press you will see in shops offering custom designs. Clamshells take up less space, great for if you have a limited workspace. Normally cheaper than swing away presses. Some people find the heat source being directly above them an issue when placing their design – fear of being burned due to working directly under the hotplate. Get a 15″ x 15″ or larger hot plate to ensure you have the maximum pressing area to handle XL++ T-Shirts and larger customized apparel. To avoid getting burned, remove the red rubber mat from under the press, lay down your design on the mat and then place under the heat source when you are ready to press! Check out the professional and more expensive models as they have pull out drawers for laying down your design away from the heat source. Higher price models also offer automatic open functions that release the press from the item when the timer is done – a great time saver when you are working on a batch of designs or interacting with clients. Like the clam shell heat press above the swing away press is a single function press i.e. you can only press flat items such as shirts. ?The difference is that instead of being a simple open and shut, the hot place can swing away from the bottom plate before and after you press. Less burn risk as the heat source is not directly above where you lay your design. 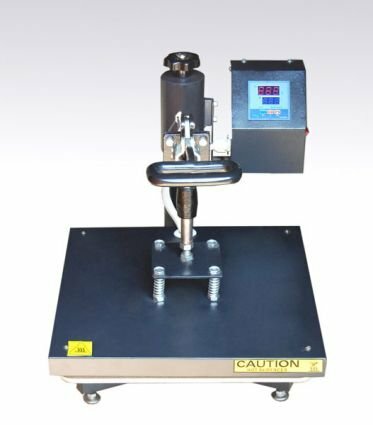 Usually swing away presses have smaller hotplates – like 9″ x 12″. Swing away presses require more space due to the swiveling hot plate. Swing away presses have more moving parts and the pull down handles have been known to break on cheaper models. Swing away presses are effectively the same as multi function heat presses BUT without the extra parts – consider what you want to offer in terms of products and don’t limit yourself to flat items if you may expand your offerings later on! Multi-function presses are the most versatile heat press option. ?Sold as 5 in 1, 6 in 1, even 8 in 1 options you have the ability to change out the heat source to press everything from plates, to hats and mugs. Each part is removable to give you the flexibility to apply HTV or do sublimation on plates and cups. The most flexible heat press option! The ability to press non-flat items using the attachments. You have to let the press cool down completely before exchanging attachments. Cheaper presses seem to have issues with the reliability of interchanging attachments. Heat plates, like swing away heat presses are usually smaller 9″ x 12″ or “12” x “15” – look for the larger heat plate to allow for pressing larger items like XL+ shirts, pillows and sheets. Requires more room in your craft space due to the swiveling heat source. Plan your production runs to save time waiting for the press to cool so you can change attachments! If you specialize in specific product lines you may want to invest in a press to meet those needs. You can buy single function heat presses for hats, plates, mugs as well as label/tag and logo placement. 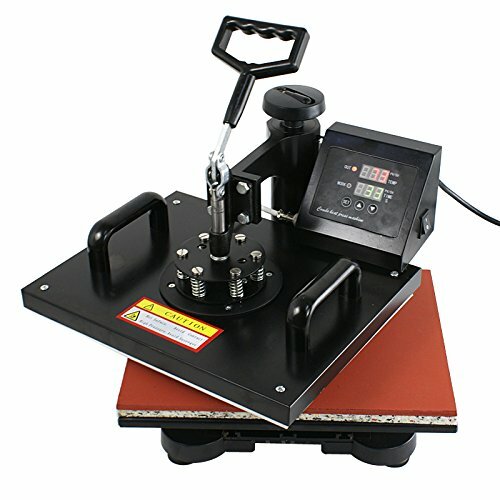 Best heat press for the specific job in hand! Limited functionality due to single use.